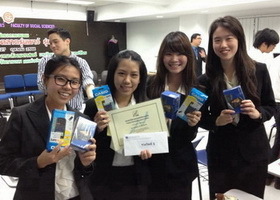 On October 27th 2012, team �Researcherry� from BBA Thammasat represented the university and won the first place in a competition at Young Marketing Research Training#9 (YMRT). 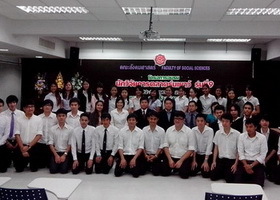 The team consisted of four members: Ms.Thanyanuch Kanokmaneechotikul (Mook), Ms.Patrapatu Charanvatnakrit (Bonita), Ms.Pimpann Pimolcheewin (Pear), and Ms.Thananthorn Lertpraival (Peach). We would like to thank BBA program and ajarns for shaping and supporting us all along. Also, we would like to thank Thailand Marketing Research Society (TMRS), Nokia, and CMG for holding this wonderful training and giving us chance to gain hands-on experiences. We are very proud that we have brought back another prize for BBA Thammasat, contributed to its reputation, and kept BBA to Be the Best Always! Posted date: October 31, 2012 � 10:55 Hrs.